Our dear friend Monika went missing on Tuesday, February 1st, having tragically fallen down the northeast face of Red Mountain after a cornice collapsed, leaving her skis and pack and helmet behind on the 5890 ft summit. She remained missing for the next four days (see the main thread Monika Johnson missing near alpental....), until a successful recovery effort found her on the afternoon of Saturday February 5, buried in the snow of the northeast basin about 1000 ft below the summit. Search and rescue teams brought her out to the trailhead well after midnight that night. But Monika's gear (along with Kitty) still remained up on the summit, and a group of her friends, led by Ryan Lurie, were determined to retrieve it during the first safe weather window. 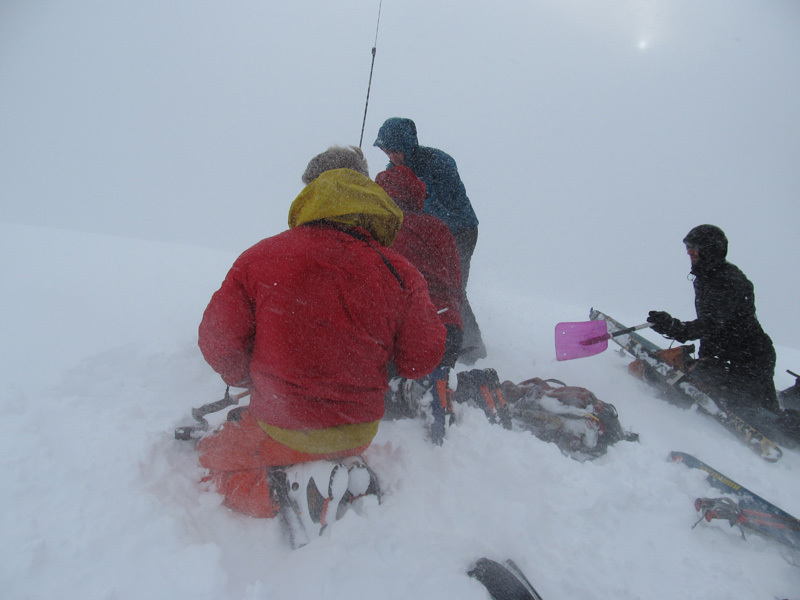 However, weather conditions during the rescue and recovery efforts had been very poor, with several inches of rainfall (including periods of freezing rain) and fluctuating temperatures pushing snow levels to 6500 ft at times. Similar conditions continued on Sunday February 6, but the forecast for Monday the 7th looked much better: snow levels falling to 2000 ft, and precip decreasing throughout the day, which should be good enough to head for the summit. Our group looking up at Red Mountain from Commonwealth Basin. 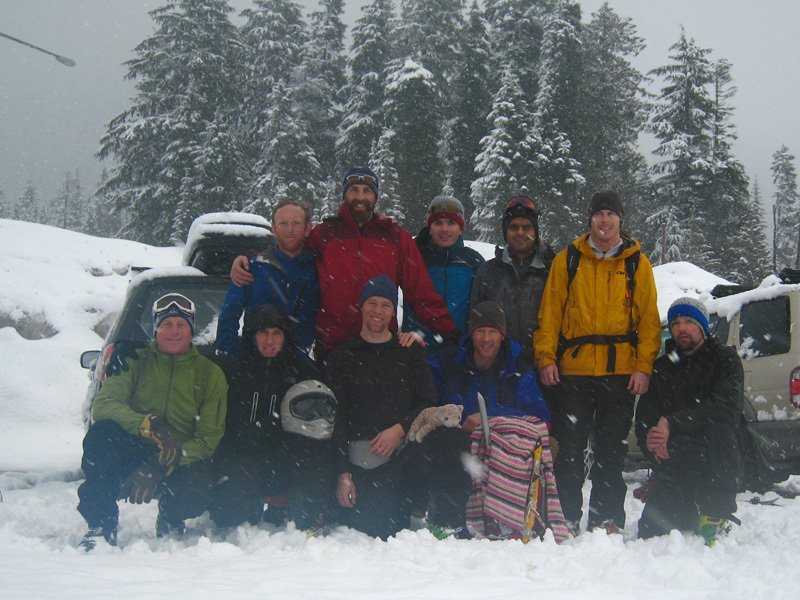 So a group of 10 of Monika's friends met today at Snoqualmie Pass at 6:30am, arriving in a snowstorm which had already dropped 2-3" of new snow at pass level in the few hours since the rain had turned to snow. We headed out for Commonwealth Basin just after 7am, the new snow taking the edge off the very marginal, low-snow, frozen-hardpack conditions along much of the route. Numerous creeks are still partially or fully exposed along the traverse into Commonwealth, making for a tedious up-down approach. We skinned to the head of the valley and up to about 4700 ft on the south face of the peak, then switched to booting on foot, following traces of a mostly-buried bootpack from several days earlier. A firm icy freezing-rain crust covered much of the south face above 5000 ft, making crampons helpful in the windblown areas where the crust was not covered by new snow. Approaching the summit of Red Mountain. We arrived on top at 10:30am in a gusty southwest wind and blowing snowfall, finding with some surprise that there was no sign of any gear, only bare blank fresh snow. 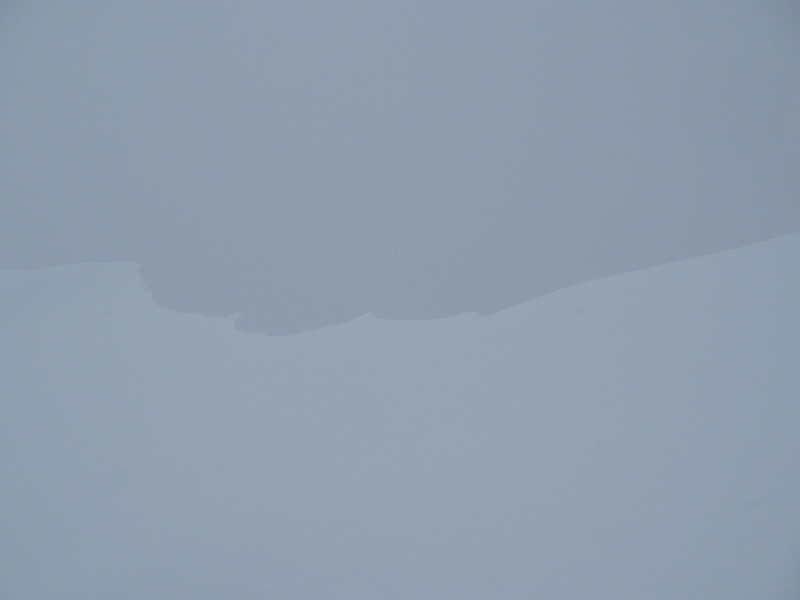 The broken portion of the cornice, a few feet west of the true summit. Taking precautions to maintain a more-than-safe distance from the corniced edge, several of us dug and probed and quickly located Monika's pack (with Kitty safely inside). 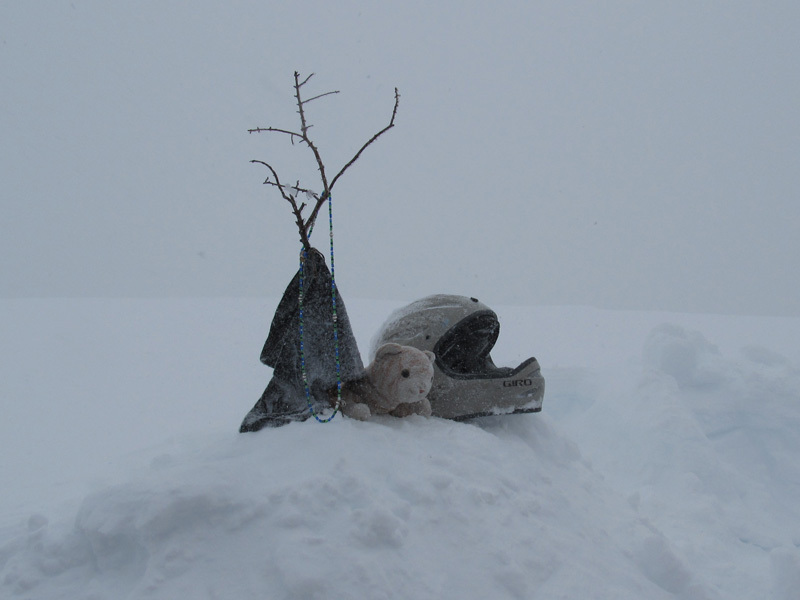 We soon found her helmet, skis, and poles nearby a few minutes later, all buried under 1-2 feet of new snow. Trying to find the snow-covered gear at the summit. We held a brief remembrance of Monika at the summit, to honor her memory and the inspiration that she continues to provide us all, and many tears were shed. We packed up her gear and skied down after about 45 minutes on the windswept summit, choosing to descend via the (hopefully much more skiable) southwest face rather than the icy south face we had climbed. The uppermost 200 ft was icy rain crust on the southwest side too, but then it was quickly covered by 6-10" of new snow, which appeared to have bonded well to the crust. 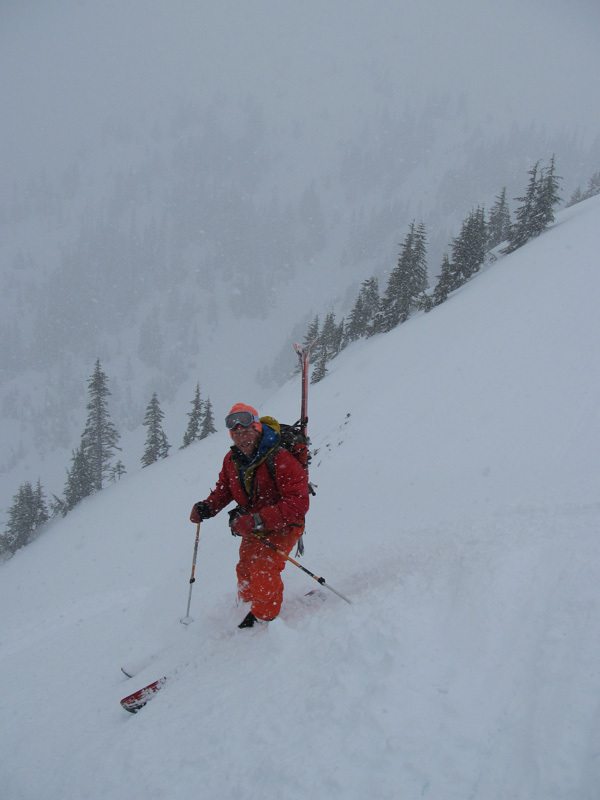 The rest of the descent was in fresh powder, with no signs of instability other than minor surface sluffs, and the skiing was unexpectedly quite good, especially so considering the very poor ski conditions on the route we had climbed. We all agreed that it was a very enjoyable ski descent, all the more so given the depth of emotions that had been released at the summit. Ryan skiing with Monika's skis on his pack. Then the long and winding exit from the basin, down our skin track from only a few hours earlier which was already filled with fresh snowfall. 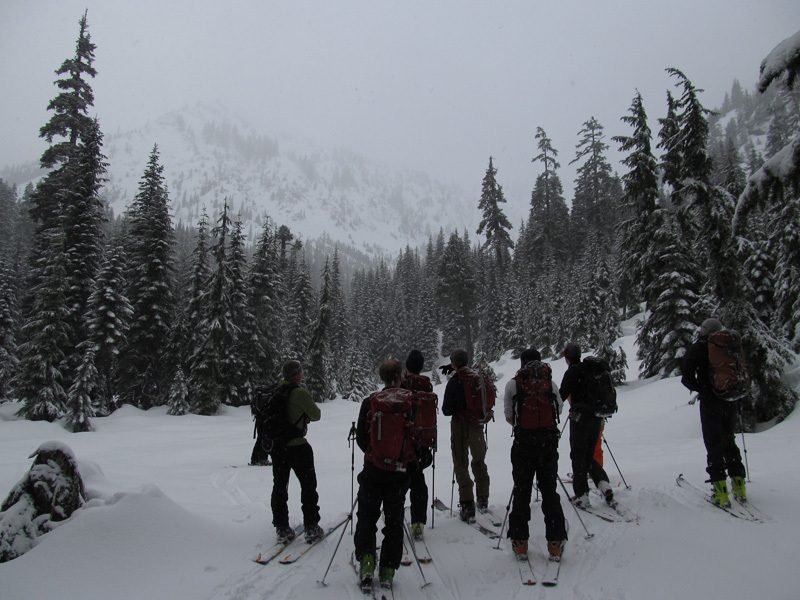 We arrived back at the pass shortly after noon, finding about 3" of new snow on our cars. Winter has returned to the Cascades, and Monika will be with us always. Our group with Monika's helmet and Kitty after the trip. I hope that others in our group who went up Red Mountain today will post more photos and any personal recollections of the day here. I think that this was a very important day for us to come together and do this.�I wish that a few more friends of Monika's and ours had been able to join us out there too. Bad Weather, Beautiful motives.� Looks as if the mountains themselves have been upset as well as mourning. A great friend of mine died via a cornice release back last October in Asia.� I really appreciate seeing folks come together to honor, dedicate some time and energy, and retrieve what should be coming home. Thank-you, Gentlemen. I can't imagine how hard that must have been. Thank-you. Strong work you guys. The shrine kills me. Beautiful. Beautiful. Important. Thank you all. Thank you all for doing this. Just reading about it is heart wrenching. I showed the picture of Monika's helmet and kitty on the summit to my wife last night and we both had tears. Both for Monika's loss and for the amazing community we have here in the Cascades. It has been an amazing experiance to see the number of people Monika affected and to meet many of them. She brought out the best in people and it is not suprising to find out her many friends are also great people. She was so special to us all. Thank you Monika for your friendship and your friends. 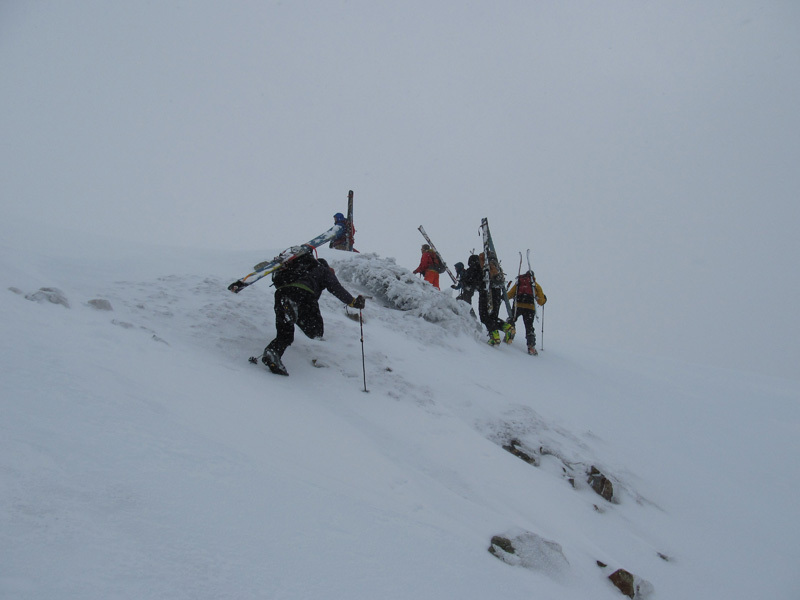 The first photo is the group nearing the summit and second photo is Ryan carrying Monika's skis. Thanks guys for bringing some about closure. I'm not sure what was more difficult:� being and seeing her during the recovery mission on Saturday or seeing her stuff on the summit of Red yesterday.� I just know that I went full circle on this (for support & respect) with some amazing folks on this absolutely mind blowing & numbing tragedy.� As Dave Brown said, she brought out the best in people (even each time in the multiple conversations/interactions I'd had with her since I met her a few years back), and this was never more evident than the past few days. Spoke about the multiple stages of grief with a counselor/thearapist friend of mine today because at times I unexpectedly come across a wave of emotion & it all comes out.� This will take some time, if ever, to accept. The picture of her helmet and kitty brings tears. Amar:� Great write up.�I loved how you presented the story. Drew and Dan H.:� It was a pleasure to see power and grace combined with humility. It's very moving to read the trip report and I commend you all for your efforts! �Beautiful picture of the shine. �Thanks to all! If possible include an approximate date for the photo and location. If there are any others in the picture, include their names too. I only knew Monika through the glacier travel class but her loss has made me very sad. It's hard to lose someone who shares our love of wild places. Thanks guys for your efforts! Well done. Flintofts� online Obit for Monika shows her memorial service to be scheduled for 7:00 pm on 2/17. More details on the service and location are posted HERE. Monika brought it every time to the Alpental race and seem to be having a blast. the stuffed cats putting the hammer down in Monika's honor.